We are launching our new email newsletter system very shortly. 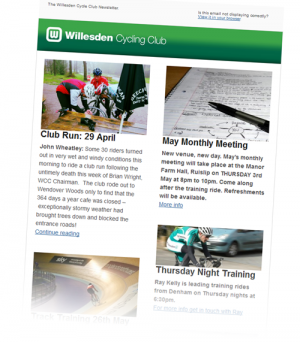 Sign up using the simple form below and recieve Willesden CC news directly in your inbox. Signing up couldn’t be easier, just fill in the form below and hit ‘subscribe’ then follow the onscreen instructions. This entry was posted in Membership, Website News. Bookmark the permalink. When I subscribe it says I am already on the list. Is this the case in general for club members or because I have edit rights to the hub? I shall check with Tom Zittel. It might be that he has already subscribed club members. Rich is right, with the help of John Wheatley and Liz Creese I have imported as many member email addresses that we could gather. (about 130) The reason that it says you are already subscribed is that we have added your email address already, result! By the way if you have any club members addresses that we may have missed please shoot me an email (tommyjz[at]gmail.com) and Ill check our list.